Friday, 11.30 am and time to leave Shravanabelagola and move to our second and third destination for the day: Belur and Halebidu. Belur is very famous for its Chenna Kesava temple, dedicated to Lord Vijayanarayana, one of the twenty-four incarnations of Vishnu. Halebidu, that used to be the capital of the Hoysala Empire, is very well-known for its Hoysaleswara temple dedicated to Lord Shiva. Chenna Kesava temple in Belur is amazing from an architectural standpoint: it welcomes pilgrims and visitors with a huge Gopuram at the entrance (a big tower richly adorned typical in many Hindu temples) and passing trough it is like leaving this world behind to get access to a higher one. The temple complex is big, minor temples run around the main one built on a star-base as it is usual in the Hoysala style. I enter through the Gopuram and I go straight to the main temple which is beautifully carved on the outside walls. Nonetheless, once inside, I can’t stay long: storms of pilgrims and tourists are all over the place and it is just impossible for me to collect my inner self. So I leave it and go for a walk around. My attention is caught by the columnade on the right hand side. As I get nearer, statues and high-reliefs appear to me… those are many and impressive. I walk along the lane looking at each one of them when, midway, I incur in an astonishing representation of Lord Ganesha. 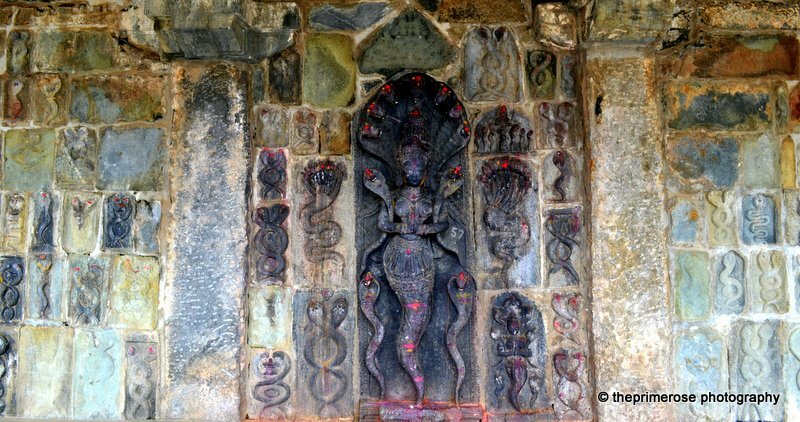 Following that a wall plenty of ‘nagas’, divine snakes. I spend a few moments here before realizing that this is an amazing set of 5 walls fully and beautifully sculpted where the 2 outer ones brings 2 different representations of Lord Ganesha, the 2 in the middle have many ‘nagas’ which are surrounding an amazing representation of ‘Nagadeva’ in the centre, a deity half snake (from the waist down) and half woman (from the waste up). Impressive in every single detail! Let me tell you: I’ve never liked snakes! Live – I can still remember a few unhappy encounters while growing up on a farm in the South of Italy – fake, in images… whatever… but here, as I am facing this wall, I can only feel peace and a strong attraction. This temple is dedicated to Lord Shiva in 2 different representations: a cobra and a face mask. I have never seen that before! The overall complex is smaller than the Belur one but it contains 2 big ‘nandis’ (bulls, which are the vehicles of Lord Shiva) just facing the 2 doors through which you can see Lord Shiva representations and the main temple is definitely the most big and impressive. On its back, which actually is the right hand side for today visitors, the carvings are m.a.n.y, beautiful and perfectly preserved. This time the visit was shorter for me, definitely a lot to digest… and I’m not talking about the food I had at lunch. All in all it was an amazing day, the places truly worth seeing and full of vibrant energy. The very next day, I felt completely wrecked! 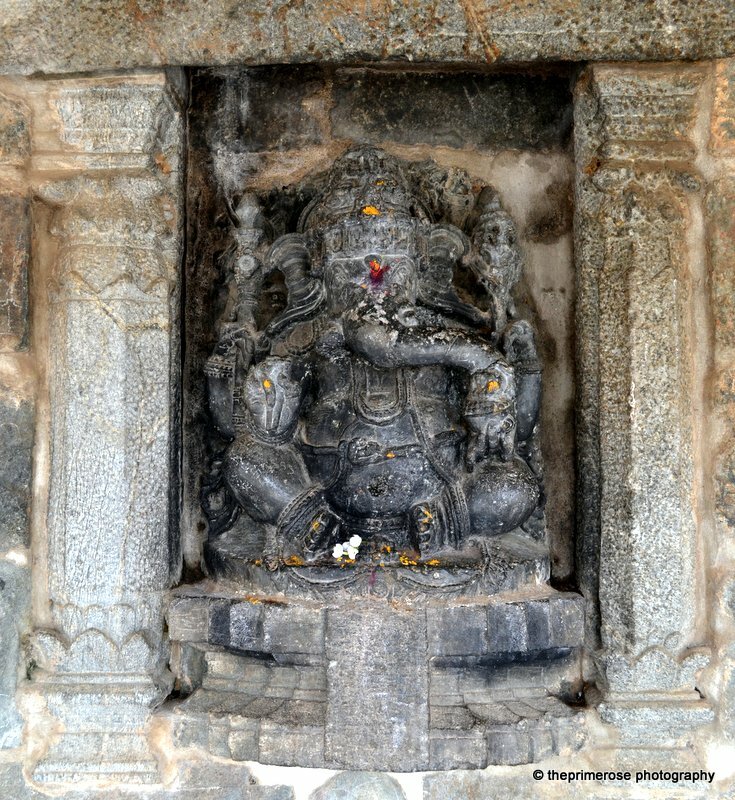 This entry was posted in India, Travelling Around and tagged Belur, devotion, Halebidu, Hindu temples, Hinduism, incredible india, India, Lord Ganesha, meditation, Nagadeva, travelling to India. Bookmark the permalink.